The days are coming to precious few, but summer is still here. And grillin’ is still the norm. 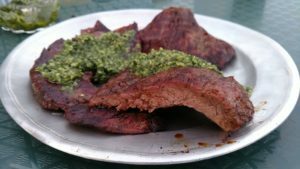 With that in mind, below are two recipes for grilled steak (Biftec a la Parrilla). This is the Nuyorican way of doing it. And here, a little historical perspective in order. Prior to the arrival of the Americans in 1898, grilling as we know it, was not prevalent in Puerto Rico. Other Caribbean Islands did have barbacoa, but nothing like our barbecue with the grill and all the other accouterments. Some state that the Carib Indians did have barbacoa, but it was for cooking human beings in ritual sacrifices. Not an appetizing idea. Growing up in Spanish Harlem, we had no such thing as barbecue. But with Americanization, and when Boricuas started moving to the suburbs, it became as popular as elsewhere. My parents and grandparents could not recall anyone doing outdoor grilling when they were growing up. But, once they came to the mainland, it took root. 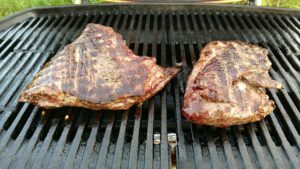 Naturally, our grilling was, and is, different in that we utilized all the herbs and ingredients native to our cuisine. Thus our dishes come out a little more spicy and, to my mind, the better for it. The two dishes given are convenient that the ingredients used are probably in your cupboard already. Or they can be acquired with ease from the nearest store or greengrocer. The dishes call for 4 steaks, and any good steak variety can be used, be it strip steak, boneless rib-eye, filet mignon or other. They should be from 1 ¼ to 1½ inches thick, and about from 10 to 12 ounces each. The steaks should be grilled 3 to 5 minutes for medium rare (an internal temperature of 135 degrees F.), 5 to 7 minutes for medium (140 degrees F.), 8 to 10 minutes for medium-well (150 degrees F.). Turned once during cooking, and they should be slightly charred for medium-well. Also, transfer to a cutting board, and let rest 5 minutes before slicing. This is classic barbecue, so the preferred beverage is beer or ale. If you desire a wine, then a fruity Chenin Blanc for a white. If you’ll partial to reds, then a zesty Zinfandel or a silky Pinot Noir. If you can’t make up your mind, then go with the compromise choice of almost everyone, a light vintage rosé. Brush steaks with olive oil (2 tablespoons). Combine 1 tablespoon ground black pepper; 1/2 teaspoon salt; 1 tablespoon dried oregano (or 1 teaspoon dried); 1 tablespoons garlic powder; 1 tablespoon ground cumin; 1 tablespoon brown sugar; ½ teaspoon chili powder (optional). 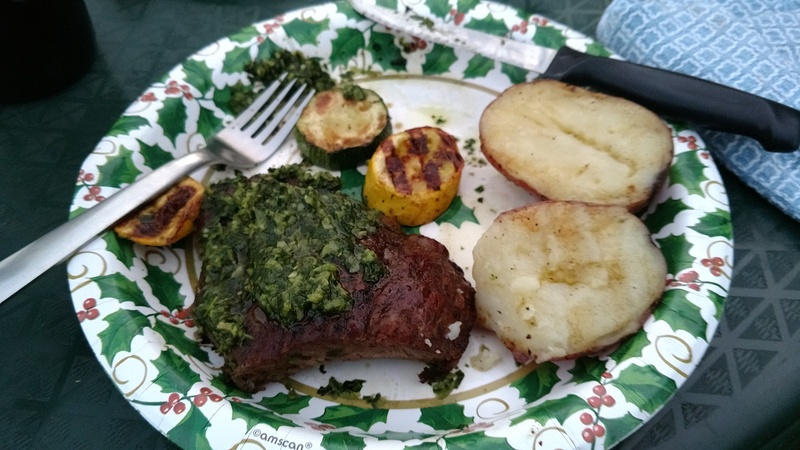 Season steaks with herb mix and grill on medium-high flame. In a food processor, add ½ cup basil (or parsley or cilantro); 1 tablespoons fresh oregano or 1 teaspoon dried); 4 cloves garlic; 1 small onion, chopped; 2 tablespoons red wine vinegar; and ¼ cup olive oil. Chop for 1 minute until everything is finely diced. Melt 3 tablespoons butter and sauté herb mix for about 2 minutes. Set aside. Season steaks with salt and black pepper to taste. Grill on medium-high until preferred doneness. Serve steaks topped with the herb mixture.